Oooo..1Puteri.. that is so cool! If I see this license plate on the highway, then I'll know it's you =P Oh, I drive a mommyvan, too..lol. Haha, yes, the minivan! The vehicle of choice if you have kids!! Better known at the mommy mobile! Congratulations! 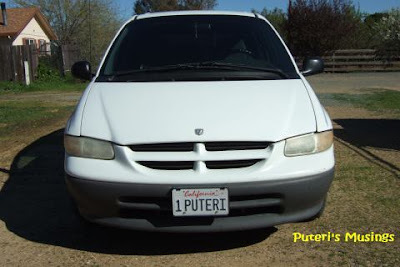 Pama amat plate kereta iya! 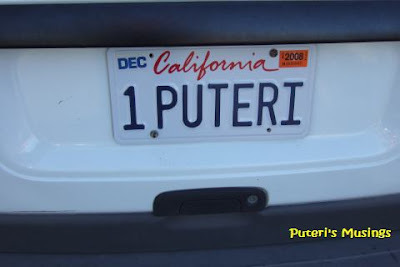 Enda mahal enti kitai nempah plate bakanyak? Looks good on your minivan! Enda mar, Pat. Mina bayar tahunan iya lebih mimit ari plate biasa. HI, yes, it does look good! Will look even better if I upgrade the minivan to a new model! Haha! So when are you going to get a custom plate of your own? LOL. Yes, it did take a while to get the plates. The Dept. 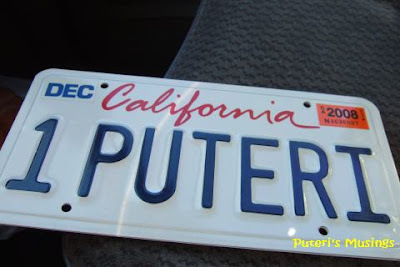 of Motor Vehicles was probably trying to determine if PUTERI was on their prohibited word list. Thanks for the gift, sweetie! Green, enda pedis ngingat plate tu! Plate lama, aku nadai hafal nombor iya, main agak aja! Hehhe. Cat, aren't you going to get a custom plate yourself? Use some of that PPP money, eh! Rita, Puteri Lepak has a nice ring to it!! Haha, gives you the "easy life, no worries, no 9-5 job to go to" feel! HI, that cheap, ah? Haha, good thing the custom plate is not that expensive .. nothing compared to the thousands and thousands you have to pay back in Malaysia! That is a nice plate. Also, I agree when one has kids, a minivan is the vehicle of choice. My sister loves her van. congratulation! !..that plate name look cool! !If your plate in Malaysia that much much better! !ada class!.I wanna a custom plate buy hubby don't think it's necessary"sigh"
Hi 1 Puteri, wow! Love that plate of yours, real classy. Here too lots of Canadians have these personalised plates. Some are real howlers too. Puteri, how many alphabets or numbers there? Nice Dodge you have, Lee. Wah...Finally came also huh? Nevermind, when you get your fancier car, you can give this one to me *Winks*...Hehe! This is way to cool. Congratulations in finally getting it. Lee, we are only allowed 7 characters and half space. Does you car have a personalized plate? Daphne, if I get a fancier car, I will transfer the plate to the new car! Hehe, cannot give away la. Congratulations on your new plate! Thanks Ian! Thank YOU for the suggestion!